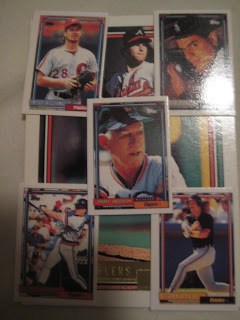 I got a whole bunch of great cards yesterday from Dave at Funny Baseball Cards. I sent him some cards with funny pictures or names and he sent me some of his "boring" cards that he wanted to get rid of, which I don't find boring at all. 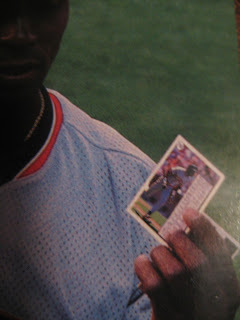 (Although he did send a lot of 1990 Donruss - anybody have any needs for that set? My wife saw me sorting all these cards with orange backs and asked me why I got Halloween cards). 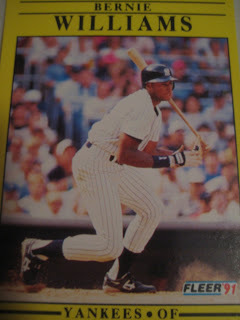 ... or were great Yankees I didn't previously have, like this Bernie Williams rookie. Perhaps the coolest were some 1992 Topps Micro. I had never seen these before, and had just read SpastikMooss's post on A Pack to Be Named Later earlier in the day. I don't think that post accurately portrays just how tiny these cards are. 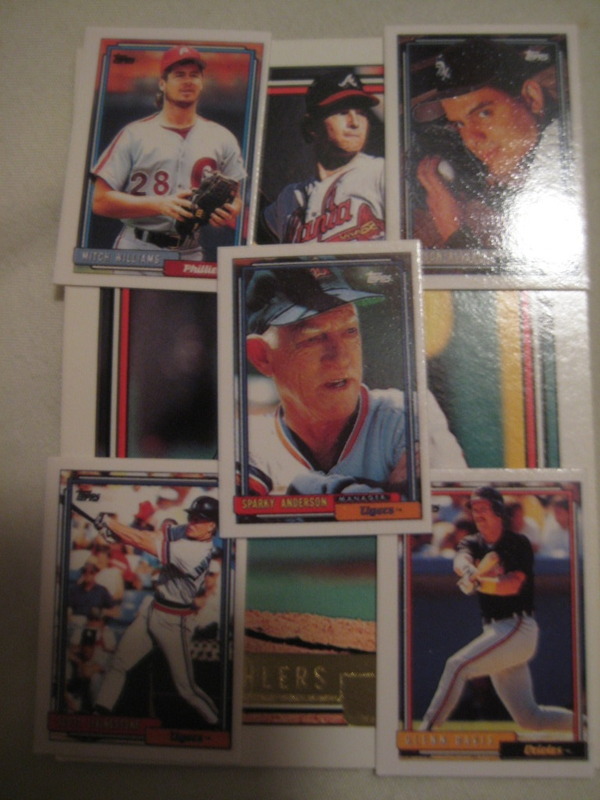 Here are some photos I took with these cards against a regularly sized 1992 Topps to show just how small they are. I put them in a little bag right away so I wouldn't lose them! 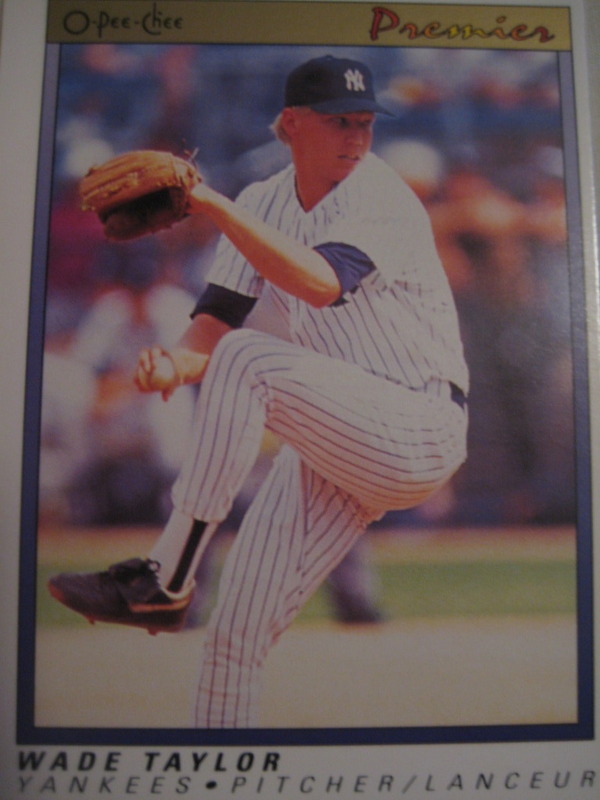 Originally drafted by the Yankees in 1992, Mike DeJean pitched ten years in the major leagues for the Rockies, Brewers, Cardinals, Orioles and Mets. He now runs Mike DeJean's Baseball and Softball Academy in Monroe, LA and kindly shared with me his favorite baseball card. 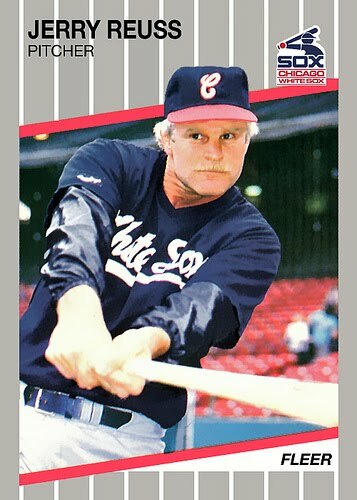 "I do like the early Rockies card where it's my upper body throwing the ball I've got a sweet mullet working." 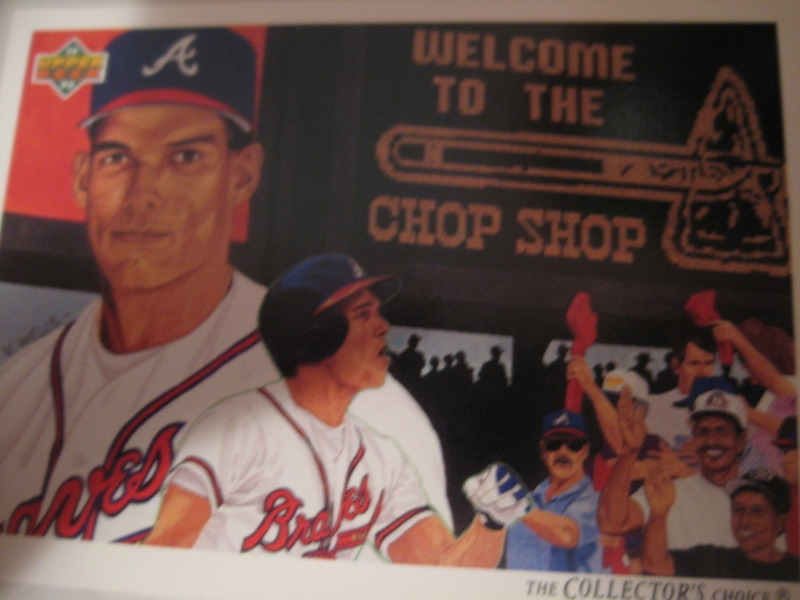 Vernon Wells Jr. is an accomplished sports artist who did the artwork for Upper Deck in it's early years. A former pro football player in the Canadian and World Leagues, he turned to art after his football career was ended by injury. Commissioned by more players and teams than any other artist, the athlete he has painted the most is his son Vernon Wells III, star outfielder for the Toronto Blue Jays. He kindly shared with me this story about this early painting of his son. "I do have a favorite card. 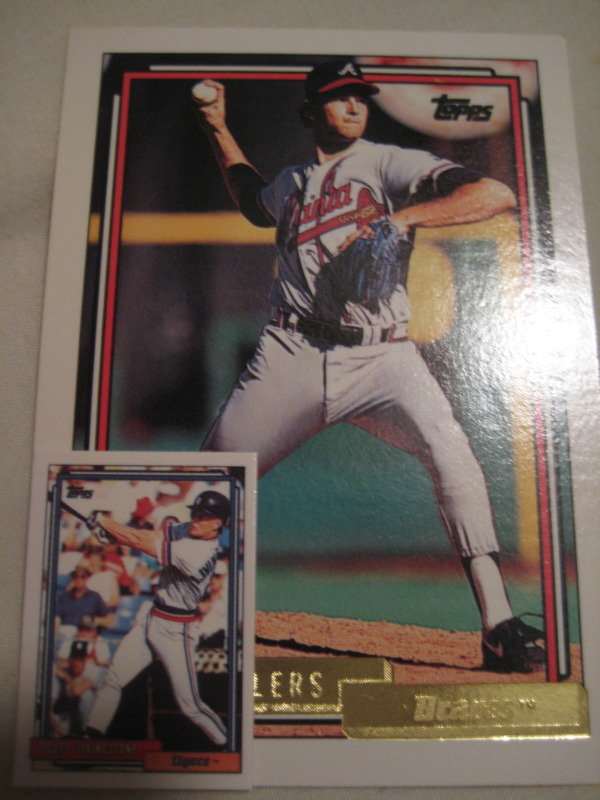 The Braves' David Justice checklist card from the 1992 Upper Deck set. It has my son and I among the fans doing the "chop". It is also the only original painting that the company allowed me to keep. In that painting, my son was 12 and wearing the cap of his baseball team that won the NAABC World Series." Ryan Tatusko is a pitcher in the Texas Rangers organization. 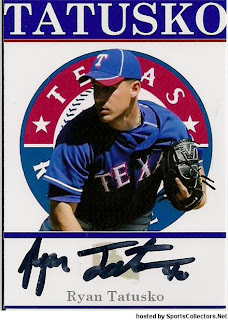 Currently pitching at AA Frisco, he is a Texas League All-Star, with a 9-2 record and 2.97 ERA. In addition to pitching for the Rangers, he contributes to the Rangers minor league blog The Newberg Report and is a pitching instructor at the Roundtripper Academy in Westfield, IN. 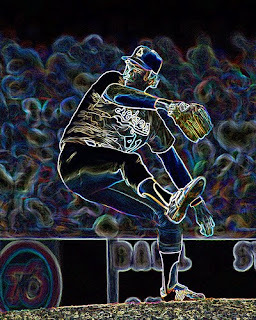 Yesterday he kindly answered my questions about baseball cards before going out and pitching six scoreless innings in a no decision against Corpus Christi. 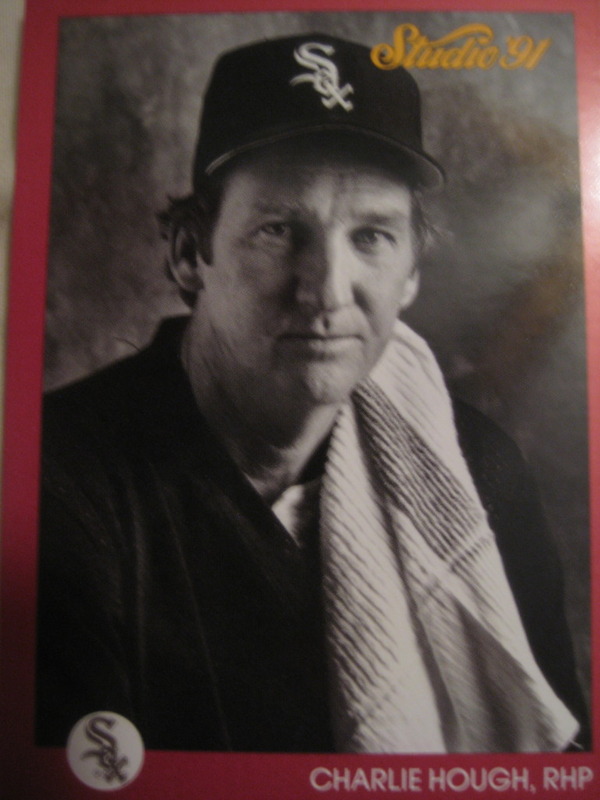 "Its kinda funny around the clubhouse people tape old cards of other players in your locker. They do it either as a joke or just if they think your good friends or something like that. People send in baseball cards all the time to get autographed and its a pretty cool experience to have that. 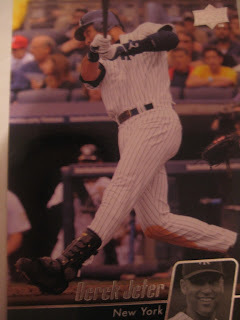 I have had fans make their own baseball cards of me, on just regular paper or on thick photostock paper and I think its really cool to see some of their own designs that they create and they usually send me a few extra to keep for myself which I appreciate greatly. I loved collecting baseball cards, I have gotten away from it. I would love to get back into it. 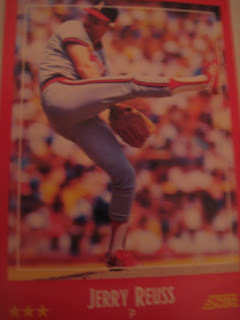 Its my dream to own a Nolan Ryan rookie card. 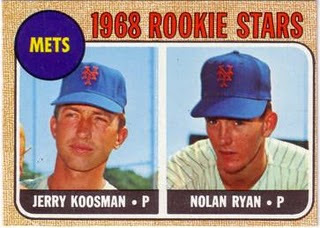 When I was a kid my dad and I used to go to card shows strictly looking for Nolan Ryan cards and I have amassed about 400 cards of his." 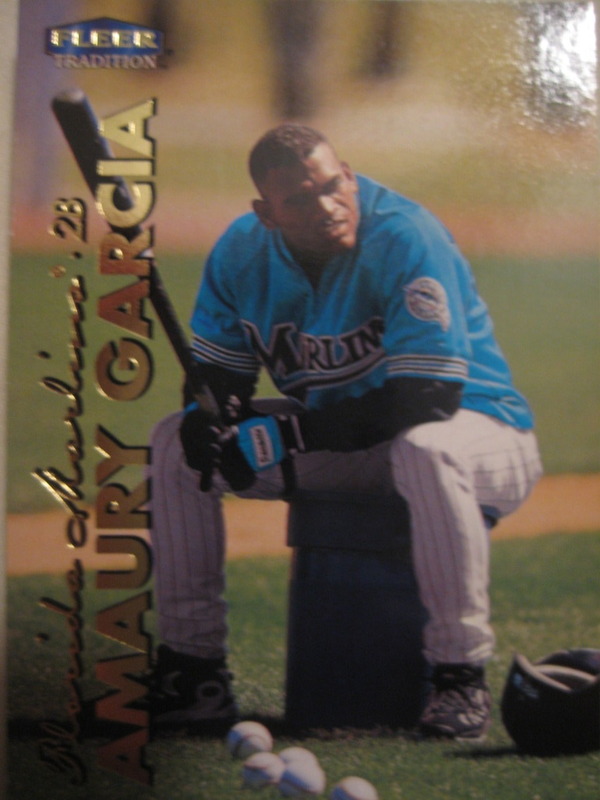 Just because Amaury Garcia hit only .250 in his 1999 call-up to the major leagues doesn't mean the Marlins should have just thrown him into the garbage pail as they apparently did here. Besides, according to his Wikipedia entry, he "is a former Major League Baseball second baseman AND art historian who played for one season." Certainly a double threat like that has some value to a team. You can take Steve Cummings out of Texas, but, as you can see on his necklace, you can't take the Texas out of Steve Cummings. In his brief professional and very brief major league career, Cummings never pitched for a Texas major league team, never pitched for a Texas minor league team, never pitched against a Texas major league team, and never pitched against a Texas minor league team. 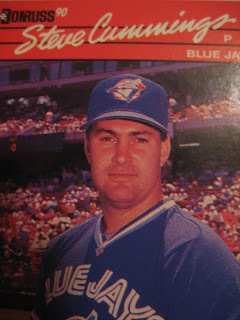 He was drafted by the Rangers in 1984 but did not sign. I wonder if he regrets that? 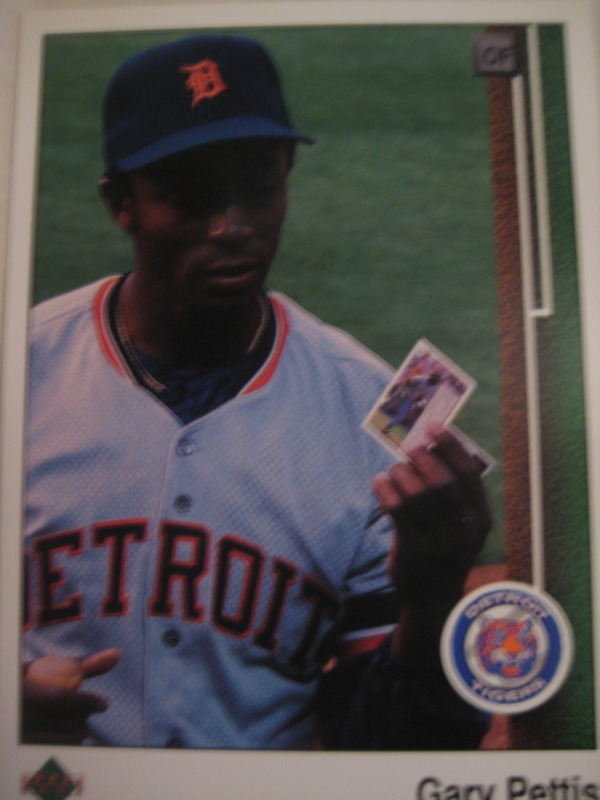 The 1989 Upper Deck Gary Pettis is pretty famous, because he is shown holding the back of that card. What is interesting, however, is that if you look closely there are a lot of differences between the card back that Pettis is holding and the actual card back. The top left with his name and vital information is not there, and there is no background behind the stats. Also, the picture cuts off at a different place on the left side. Not all of his leg is visible on the prototype card, but the whole leg is visible on the actual card. 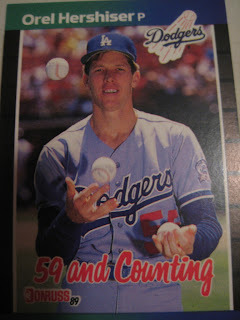 In 1988 Orel Hershiser set a record with 59 straight scoreless innings. Donruss celebrated this achievement with a awkward and goofy shot of Hershiser juggling with his pants pulled up, Urkel-style, so that his belt nearly overlaps his uniform number. 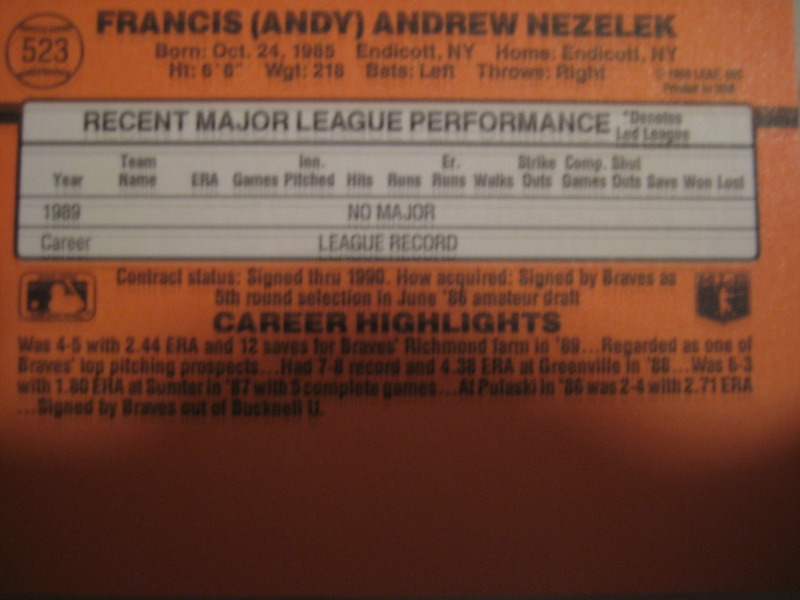 One of the funniest baseball card errors of the "junk wax" era was Donruss messing up Andy Nezelek's birthday two years in a row. 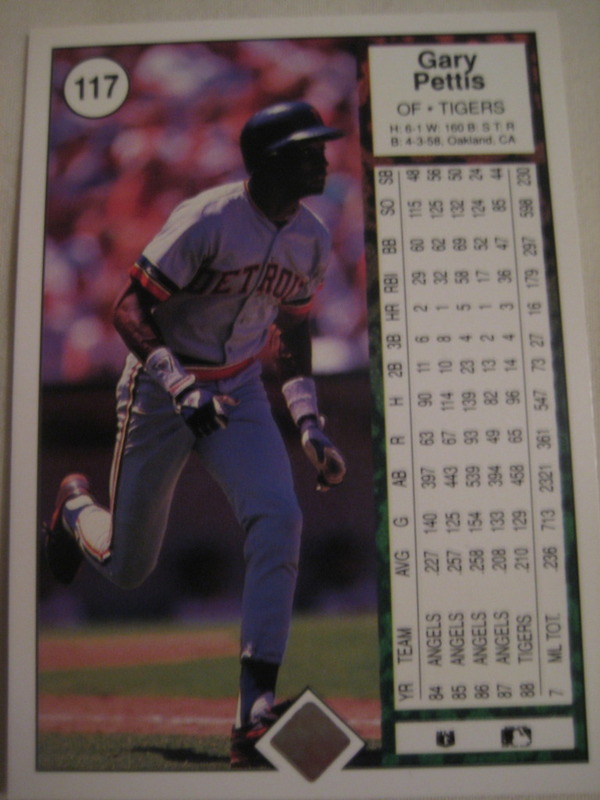 In both 1989 and 1990 Donruss, they listed his birthday as October 24, 1985 [instead of 1965], which would have made him four and then five years old on the card. 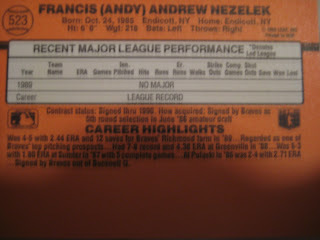 Despite being highly touted by Donruss, Nezelek never made the major leagues. However, we could one day see another card with a birthdate of October 24, 1985 - Angels minor leaguer Tyson Auer, who was actually born on that date, recently made the Midwest League all-star team. 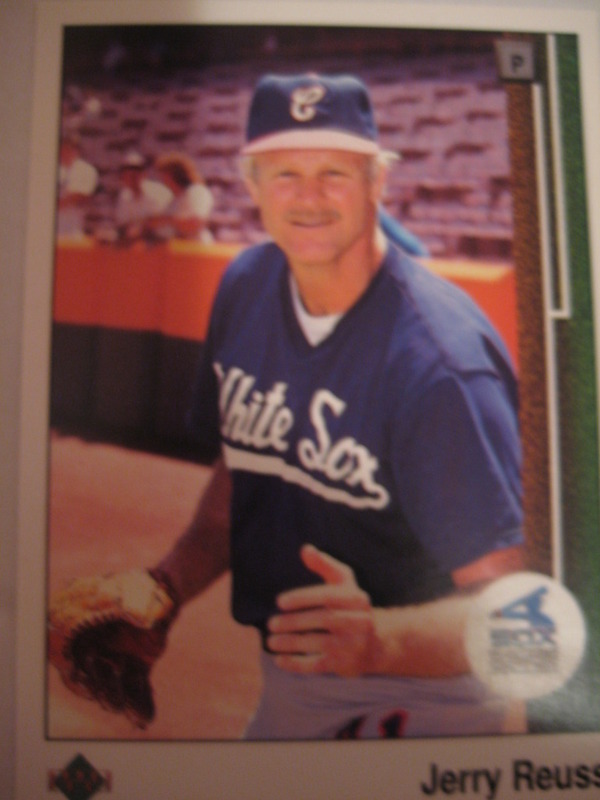 On his flickr page, Jerry Reuss has three different cards with photos from August 8, 1989. 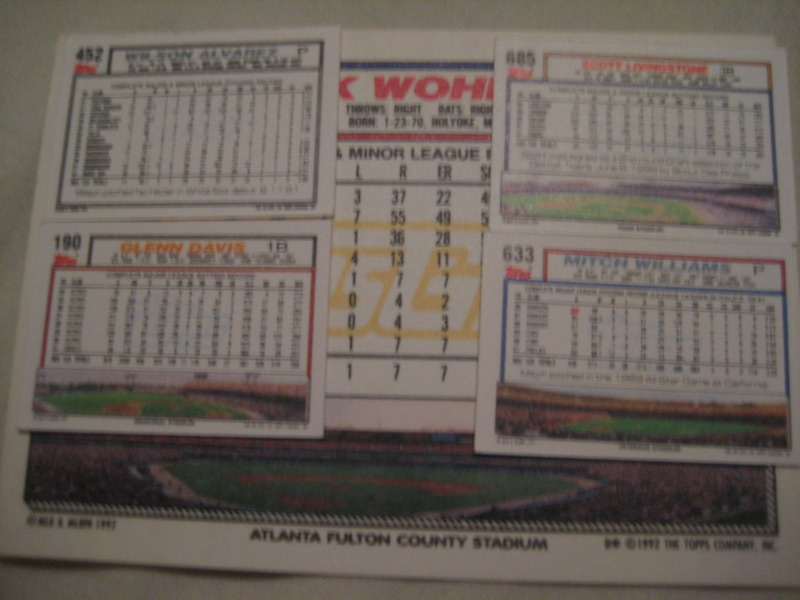 They are 1990 Fleer, 1990 Upper Deck, and 1990 KayBee. This was another rough day for Reuss. 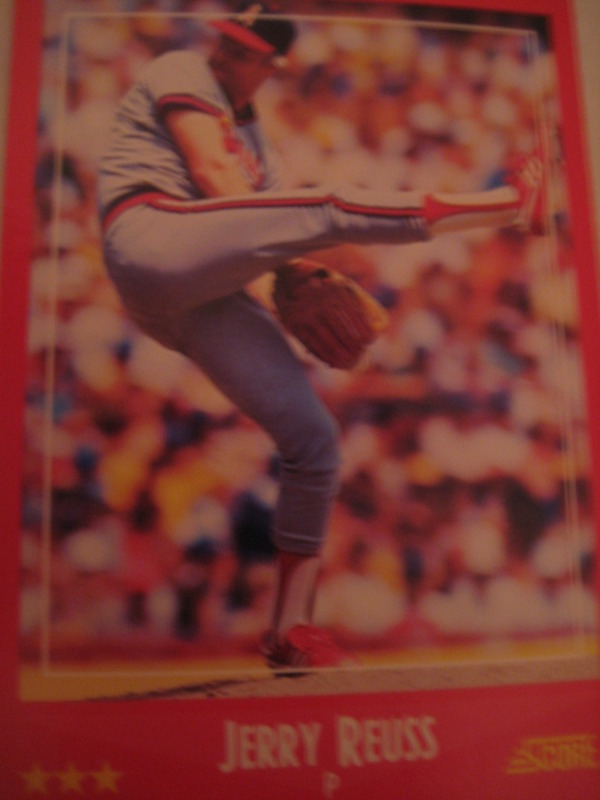 On his 1984 Topps card, it was a day he pitched well and lost. 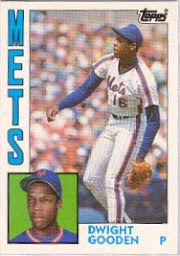 On his 1988 Score, he did not pitch well but his team managed to win. 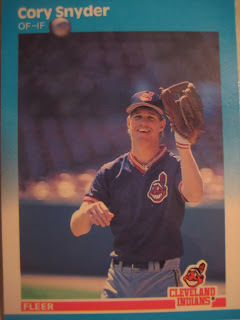 On August 8, 1989, in Detroit, Reuss was pitching well - one run in seven innings - when he injured his hamstring pitching in the seventh inning and the score tied 1-1. 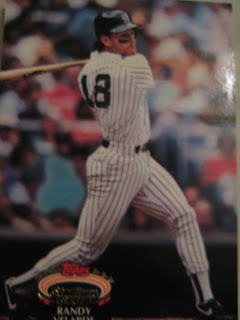 An inning later, Mike Felder would make a winner out of reliever Chuck Crim when he homered off of Jack Morris, his first home run in almost two years. 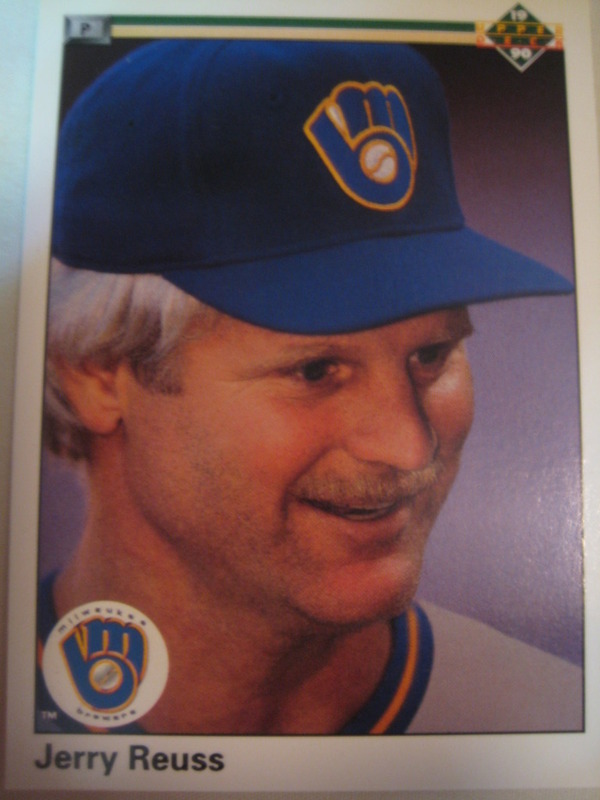 23 years ago yesterday Jerry Reuss had a rough day on the mound in Milwaukee, which was captured on his 1988 Score card. 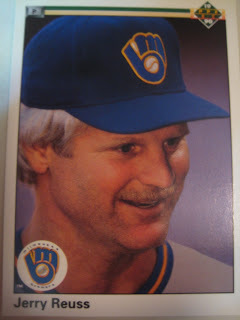 Reuss lasted just four and a third innings, giving up wind-blown home runs to Bill Schroeder and Robin Yount in a four fun fifth. The Angels would come back with a five-run eighth, capped by a bases-loaded double by Ruppert Jones to take Reuss off the hook. 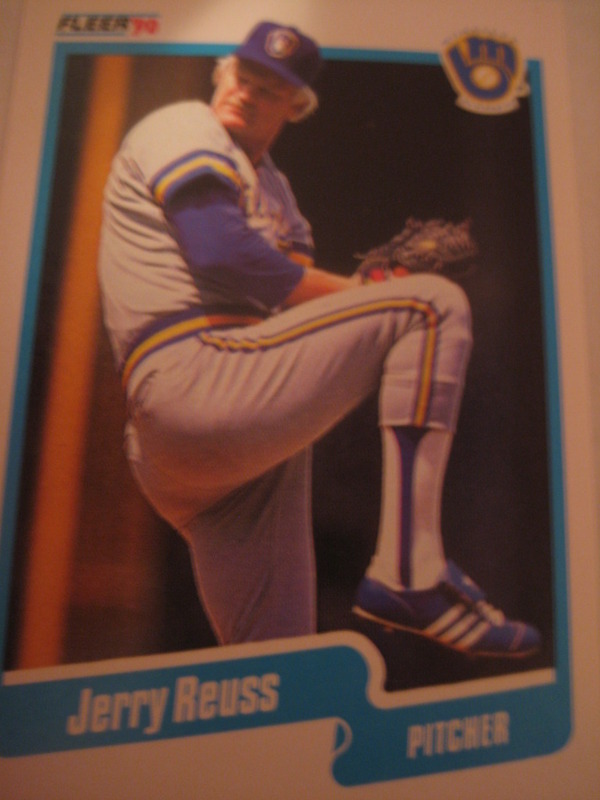 Yesterday I posted Jerry Reuss's 1984 Topps card, which on his flickr account he notes was taken on May 20, 1983. Reader John posted a question in the comments section, "How does he know that. He is able to tell the stadium from this background?" "I saw the comment on the blog and have an answer for John. 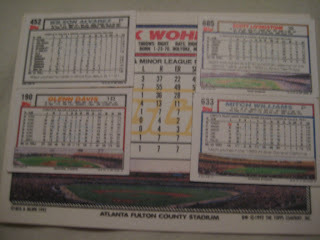 For the most part, I can identify the ballparks where the photos were taken. Since the card was released in 1984, the picture was taken in 1983 or earlier. Then it's a matter of deductive reasoning using retrosheet.org. 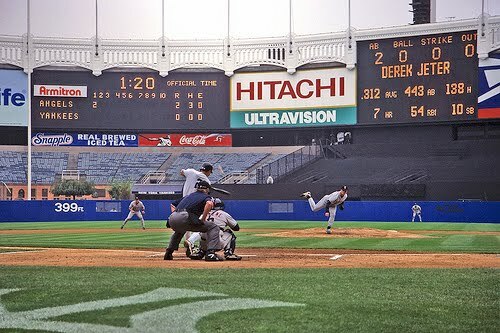 If it was a day game as it was in this shot, I see that I faced the Mets in Shea on Saturday afternoon, 5/20/1983. When all else fails, I simply look at the date on the slide or 35 mm negative as I've catalogued nearly all of them that I used for my Flickr account. The negative for this picture was from a roll taken in 1983. As you can guess, I have a lot of time on my hands!" 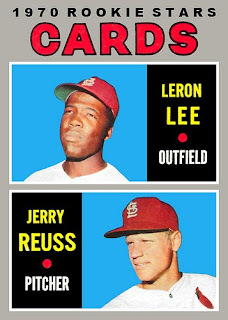 As for figuring out the stadium, one way to learn the ballparks is to see what the cards of players in their home uniforms look like, and comparing them to those with players in road uniforms. I kind of learned this without trying by spending so much time looking at my cards when I was a kid. One of the cool things about Jerry Reuss's flickr page (which he says got a lot of hits yesterday) is that for some of the cards he writes the date on which the photo was taken. 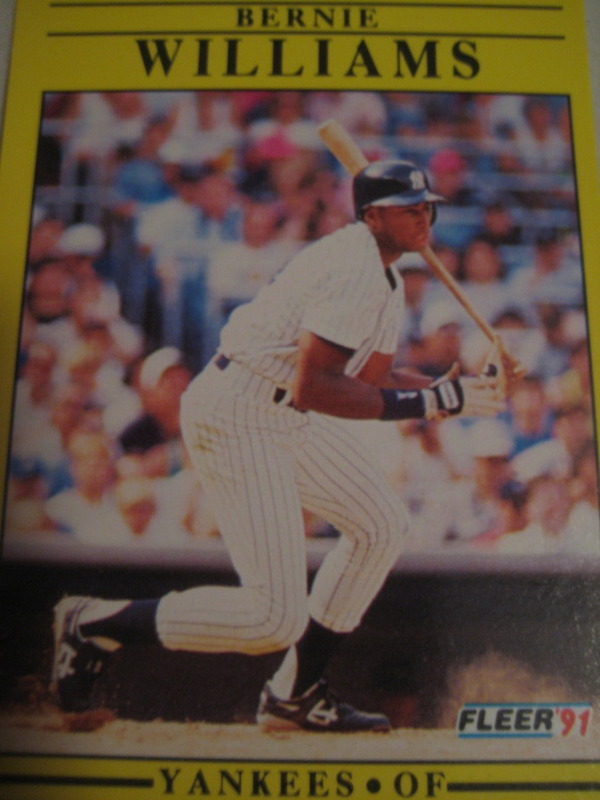 For example, his 1984 Topps card was taken on May 20, 1983. 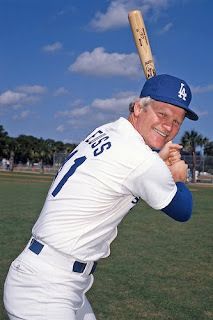 This was not a great day for Reuss, who despite pitching well (two earned runs in seven innings), he got the loss as the Dodgers were shut out by Neil Allen of the Mets. 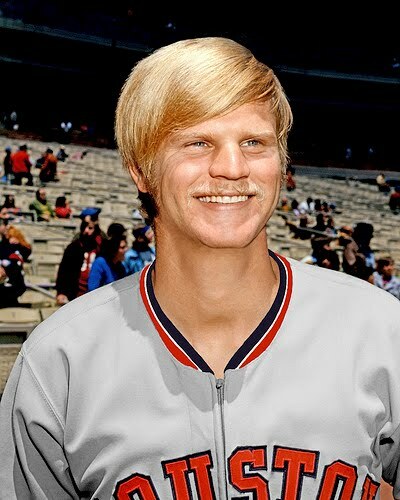 Jerry Reuss pitched 22 seasons in the major leagues, winning 220 games. 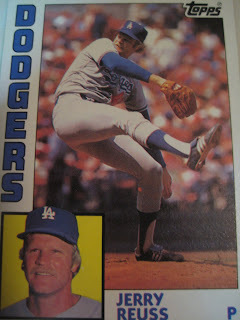 His best season was 1980, when he went 18-6 with a 2.51 ERA, leading the league with six shutouts (including a no-hitter), finishing second in the NL Cy Young voting. He is currently a broadcaster for the Dodgers, and has his own website at JerryReuss.com. Known to the baseball card blog community as a fan of Night Owl Cards, he kindly answered my own questions about baseball cards. "I captioned every one of the cards from all the manufacturers when I posted the cards on my Flickr account. Check out http://www.flickr.com/photos/43289453@N03/sets/72157622957192473/ and this site might answer some of your questions. The 1974 Topps card has an interesting story. It's on the Flickr site. My rookie card is a sentimental favorite because it was the first. 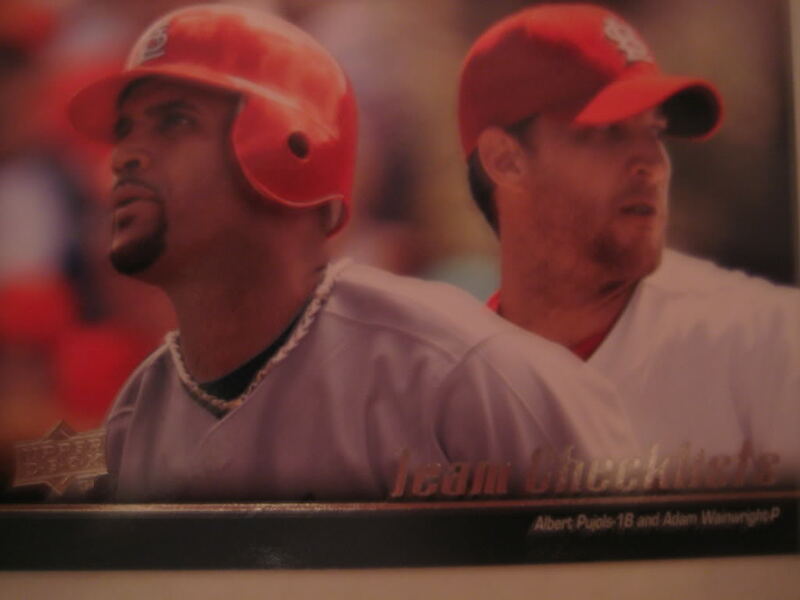 Like all of the other kids I grew up with, we wondered what our baseball card would look like. I don't collect cards anymore. In fact, I put them in complete sets and donate them to charities, hospitals, schools, etc. for fundraisers. I kept a handful of complete sets for family members, however." Thanks! His flickr set is really pretty amazing. 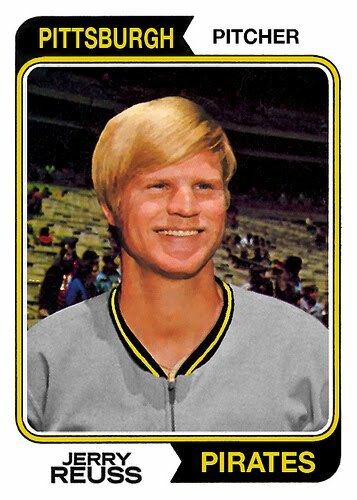 The story of the 1974 card is that it is an airbrushed version of a picture from two years earlier, when he was an Astro. There is a lot more of interest on this site. Did you know that his 1989 Upper Deck photo was snapped by legendary photographer V.J. Lovero? Here is his 1989 Fleer, which is a good example of altered font. 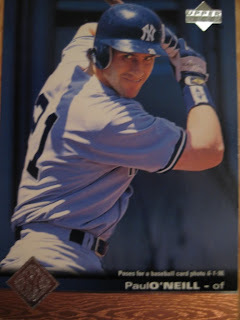 His caption says "I asked for a card with a hitting pose. Good picture, bad form!" There's lots of other great stuff on the site. 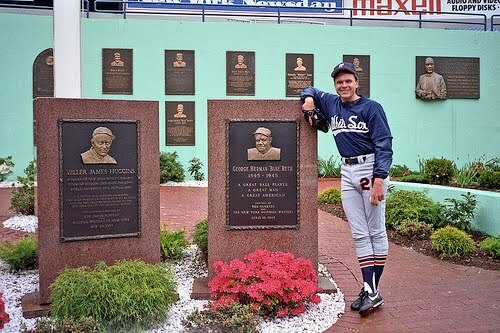 He has a lot of his own photography, both candids from his playing days, like this shot of Rick Horton in Monument Park . . .
. . . and action shots he took after his playing days, like Derek Jeter homering on Jason Dickson's first major league pitch. 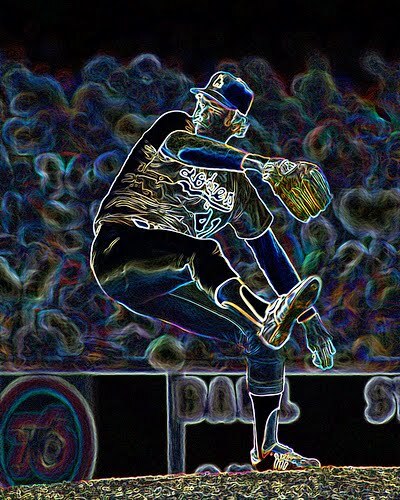 There are also some interesting pictures of himself, like this cool photoshopped image. And here is an outtake from a Topps photo session in 1985. 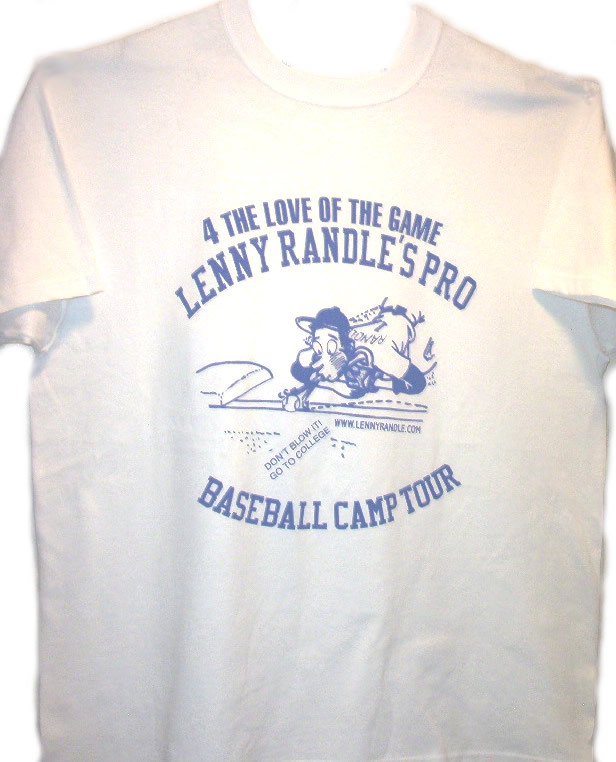 Lenny Randle played twelve seasons in the major leagues for the Senators/Rangers, Mets, Yankees, Cubs and Mariners. His most famous moment may have been the time in Seattle when he got down on his hands and knees and blew a rolling bunt foul. 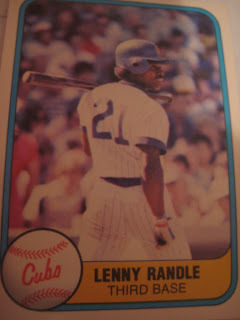 Now the proprietor of the Lenny Randle Sports Academy, he kindly replied to my questions about baseball cards. "Yes, I have cards. All are favorites. I collect cards to give away at my clinics and camps. I have 5,000 cards of players who teach at my camp." Thanks! The next camp is the Lenny Randle Las Vegas Big League Dreams Po-Man II Camp which features, in addition to Randle, former big leaguers Rudy Law, Derrell Thomas, Mike Easler, Bill Madlock, and Brian Giles (the former Met) on August 23, 24, and 25 at Big League Dreams in Las Vegas. 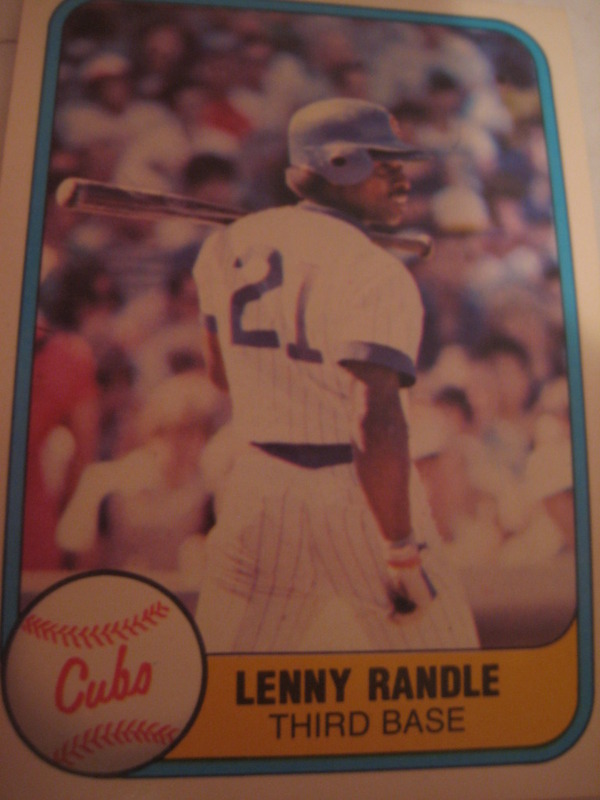 Here is one of my Lenny Randle cards, from 1981 Fleer. 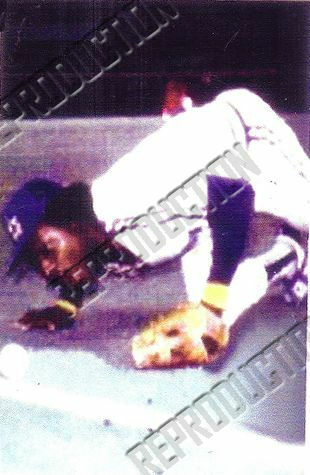 It is one of several cards of which you can buy an autographed version on his website (click on "Cool Stuff"). 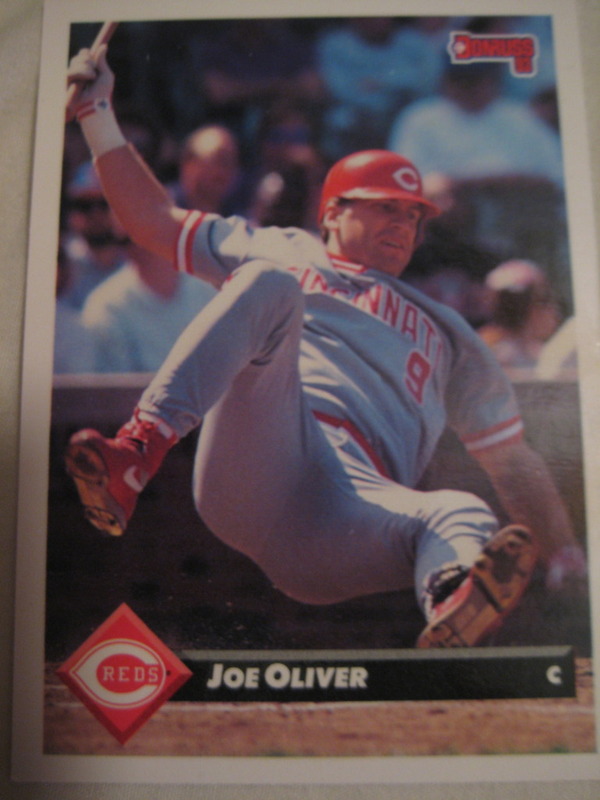 One of the cards is a custom card of him blowing the bunt foul. 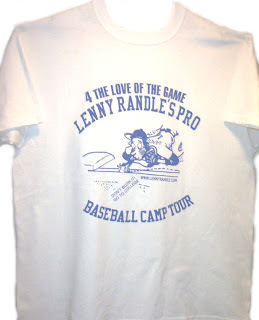 Other off-beat memorabilia you can get on his site are a CD he recorded with Mariners teammate Thad Bosley in 1980 (featuring "leftfield rhythms with an essential funk sound") and a T shirt with a cartoon of the famous bunt incident. "Don't blow it! Go to college." This four day all star break is just too long. Give me back my baseball! Since we are roughly halfway through the season, I thought it would be fun to see how my preseason predictions are turning out. Last year I did pretty well. This year - not so much. I thought Boston would be a little better than they have been, particularly their pitching. I thought Baltimore's offense would be better than it has been. Considering that the White Sox are only half a game up on the Tigers, that is some pretty impressive guessing! The Cliff Lee trade will manage to mess up my predictions for two teams in this division. Like everyone else, I overestimated the Phillies and underestimated the Mets. I still think the Phillies will improve and the Mets will decline in the second half. I thought the Reds would be good for a couple of years now, and was actually starting to get down on them this year. This was the division I was worst at predicting, but who east of Colorado cares about the NL West anyway? 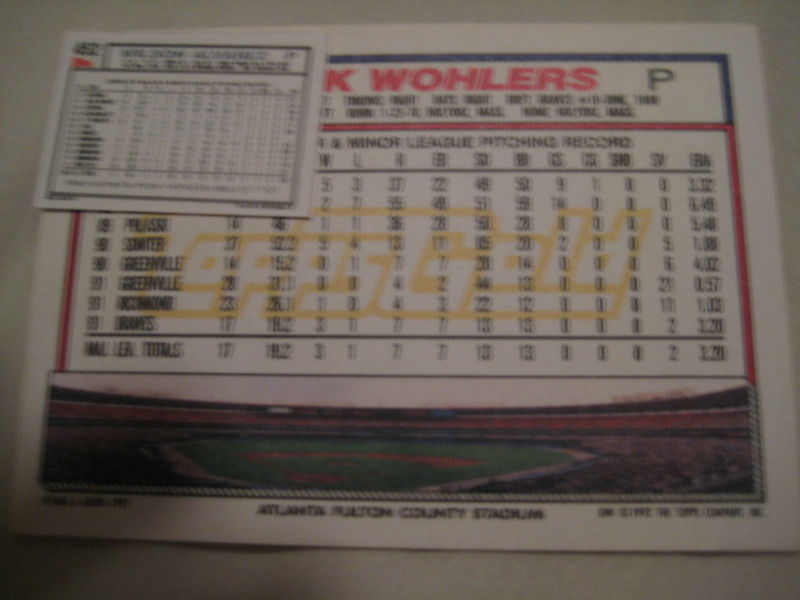 So, thanks to Phil Hughes's continued ineffectiveness, Game One of the 2010 World Series will be played in Turner Field. Hopefully the result then will be similar to the last time Turner Field hosted the Fall Classic Opener, when the Yankees beat Atlanta 4-1 on their way to a four game sweep. 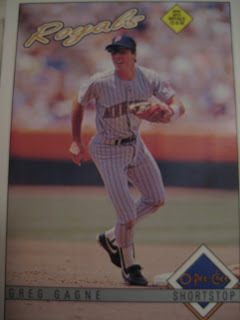 Paul O'Neill was the big hero that day, with a two-run eighth inning single off of John Rocker to break a one-all tie. 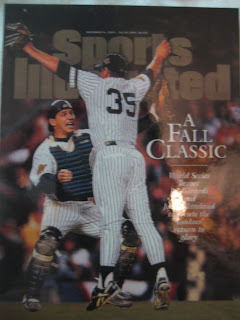 Today is a sad day for Yankee fans and for baseball fans. Despite his faults (and he did mellow over time), George Steinbrenner provided the ideal model of how a baseball team should be run. Instead of being a small piece in a large corporate cog (the way they were under CBS) or as a trophy for a mega-billionaire whose financial priorities are elsewhere, the Yankees were owned by a man (and now a family) for whom the Yankees were their sole focus. I think baseball's competitive balance would be greatly improved if the commissioner mandated that all owners must depend on their team's revenue for at least 75% of their overall income. Then you would see all the teams doing what the Yankees have done since 1973 - concentrate on putting the best team possible on the field, year in and year out. As far as I know, Steinbrenner has never appeared on a card. However, if he ever saw a card like this one, I'll bet it put a smile on his face. 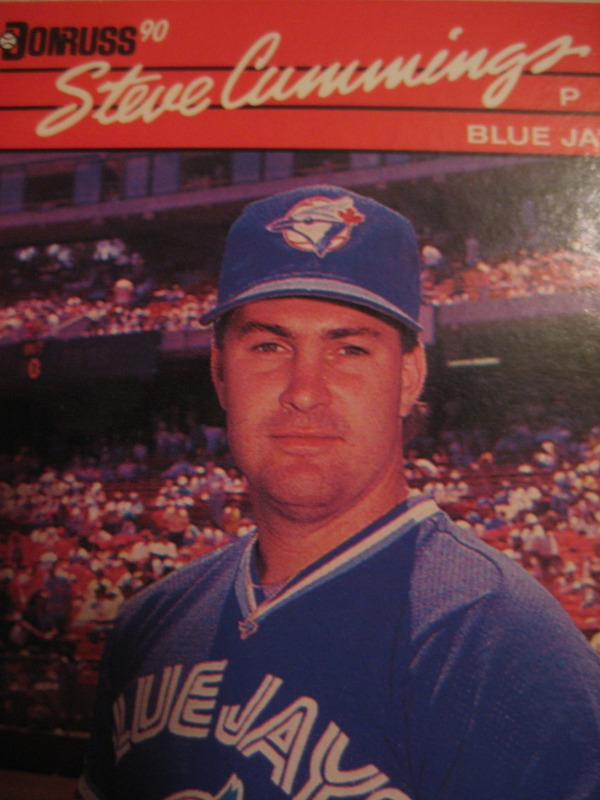 In the 1987 Fleer set, the pictures of many players overlapped the top border of the card, in which case just the player's head would be seen on the blue border. On Cory Snyder's card, they tried to get a little fancy by doing the same thing with the baseball heading towards his mitt. 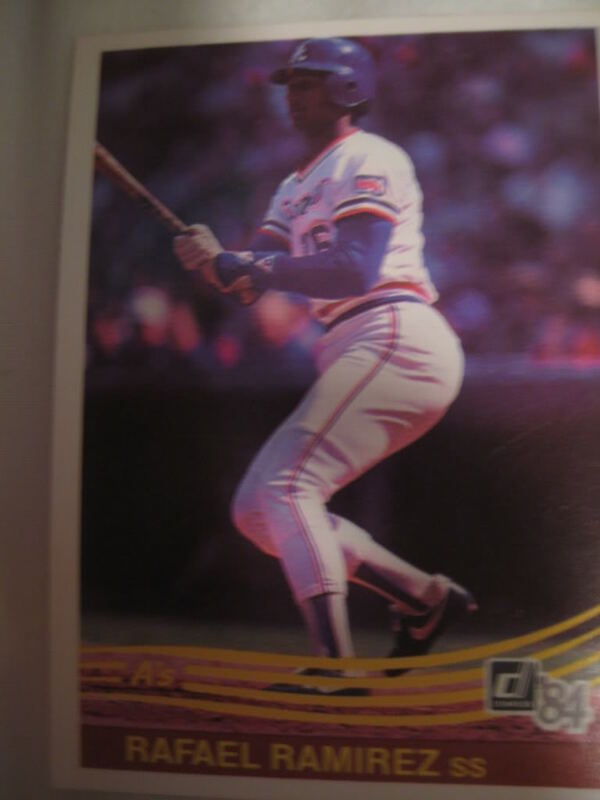 They must have had a lot of trouble with that shape, however, as you can see a lot of the background breaking the top border in addition to the ball. On Atlanta Braves shortstop Rafael Ramirez's 1984 Donruss card, he is listed on the A's instead of the Braves. How does this happen? 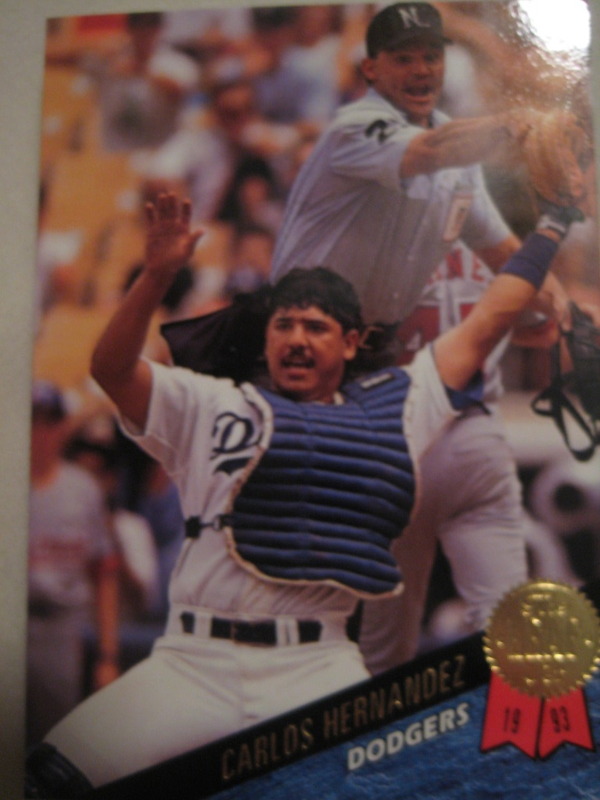 My guess is that some rookie at the card company who didn't know baseball looked at Ramirez's helmet and went, "A on his helmet? Must stand for A's." Do you like funny baseball cards?